I am just finishing a lovely serving of this tomato soup and I have got to be honest, I am not sure I was breathing while I inhaled the last few bites. 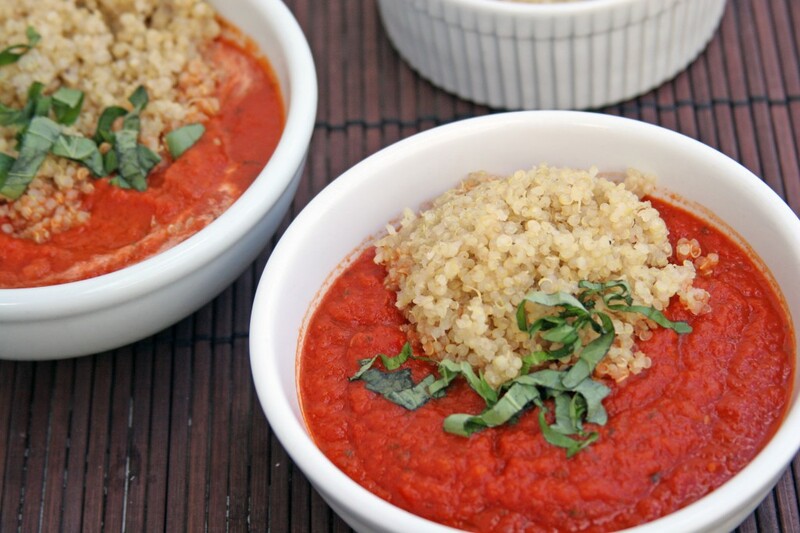 There is something special about this spicy tomato soup. It hits all of the right notes for me spicy, sweet, tangy, crunchy, and perfect seasoning is always a must. Balanced flavors coupled with a balanced meal is always a good thing. That is exactly why I added the quinoa. I enjoy tomato soup with a grilled cheese like everyone else, but this time I was looking for something different. Don’t get me wrong, the first day I made this, I ate it sans quinoa. But I made a huge triple batch in the interest of freezer meals and quick lunches. But I can’t eat grilled cheese every time I eat tomato soup, and I need grains, protein, carbs to make it a balanced meal. Duh, add it then, quinoa, brown rice, barley, farro, and wholesome grain you enjoy would work here. I chose quinoa for the texture balance, a little toothsome and crunchy. Thus, this soup was born. I am quite addicted to this tomato soup actually, so it’s a good thing I already froze a huge batch. Otherwise my plans for freezer meals are out the door. I am also a huge fan of spice, especially the smoky spice that chipotle peppers offer. I may have added to many peppers this time but I loved it! For the recipe I dialed it down a bit, and if you are not a fan of spice feel free to omit them all together. It will still be delicious, just not spicy. 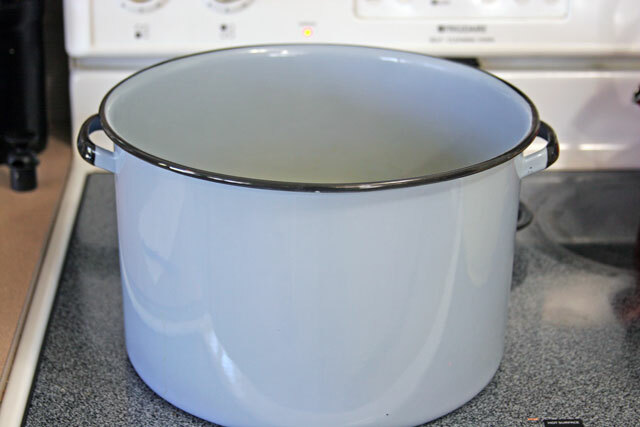 This is my blue pot, I love and use it just as much as my Dutch oven. It works great for large batch cooking and homemade stock making. I put half of the soup in ready to go pyrex individual size dishes, for grab and go meals. The other half, I froze in quart size containers. A quart is about two servings of this soup, I place it on the counter out of the freezer and let it thaw throughout the day, until I need it, then I heat it up in a pan on the stove or in a microwave. I did not, however, freeze the quinoa. I would make a fresh batch of quiona or grain each time I defrosted a batch of soup. I don’t think frozen grains are delicious. 3 diced chipotle peppers, from a can located in the “ethnic” food in any grocery store(OPTIONAL). If you don’t use the whole can, place the remaining peppers in a plastic bag or container and freeze them. They will last about 6 months in the freezer. 2 cloves minced garlic, ONLY USE GARLIC IF NOT USING CHIPOTLE PEPPERS! 1. Place about 2 tablespoons of olive oil in a large pot or dutch oven over medium low heat. Once it is hot, not smoking, add the onions and a tiny pinch of salt. Turn the heat to low and sweat the onions for 15 minutes. Adding little to no color. Low and slow to get the maximum sweetness out of the onion. 2. Add the carrots and celery, cook until tender, about 1o minutes. Add the chipotle peppers OR garlic, cook for 2-3 minutes until fragrant. Add the tomatoes and 1/2 teaspoon of salt, stir. Raise the heat to medium high, bring to a boil. Reduce the heat to medium low, cover and simmer for 45 minutes. Taste the soup, does it need more salt? Add a pinch now, about 1/4 teaspoon. Turn off heat, let cook for 5 minutes. Add basil. 3. If you have an immersion blender, blend the soup until desired consistency. 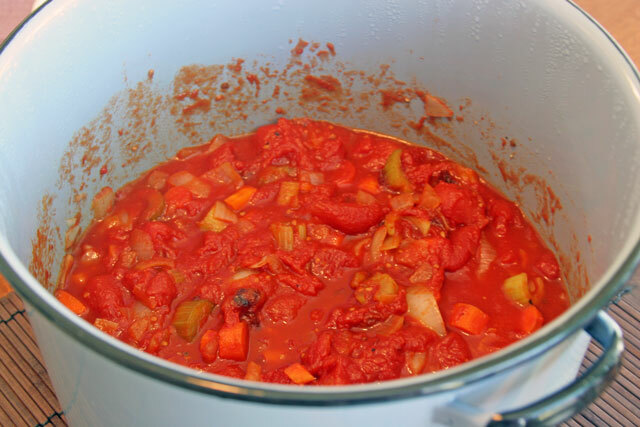 If you are using a food processor or blender, add 2 ladle of chunky soup to it at a time. If you add too much, it will boil up and burn you. Blend well each time and place blended soup into a large bowl. 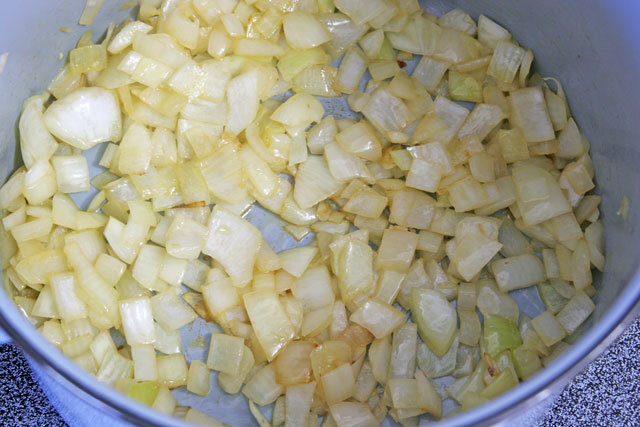 Blend all of the soup and return the soup back to the pot over medium heat for 1o minutes or until hot. Turn heat off. Check the seasoning, does it need salt or pepper? I added 1/4 teaspoon of salt and 1 teaspoon of fresh cracked pepper. 4. Serve the soup with chiffonade basil and 2 tablespoons of cream or creme fraiche and about 1/4 cup scoop of quinoa. This is exactly the kind of soup I love best: a huge mass of spicy, savory pureed veg with an unexpected garnish that makes it a full meal. And I agree 100% with freezing your leftovers for future soup application. Yay!